Remote, low budget, basic Peak District Camping Barn with stunning views and dale walks. Ideal place for family, friends, scouts and school groups to get together around a cosy wood burning stove. 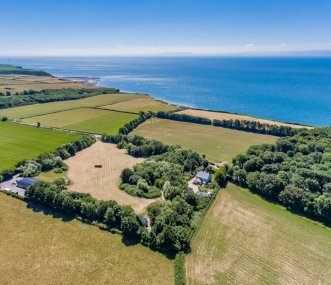 2 luxury safari tents on a working organic farm in Devon overlooking a lake and woodland in the picturesque village of Bratton Clovelly. A cross between luxury chic and country sophistication. Separate glamping pods for seating, cooking and sleeping, with nearly all the comforts of home, warm, secure, but with indoor and outdoor spaces. Sleeps 12, pet friendly. Fantastic seaside setting. Luxury glamping tucked between trees and wildflowers over 7.5 acres offering views of the wild seas. Sleeps 13 plus 7 in bell tents. Exclusive use. 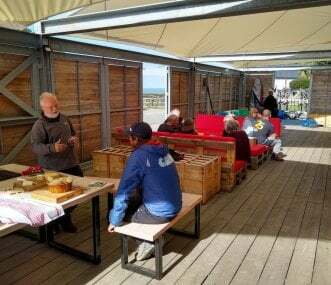 New Pavilion opening March 2019 for groups. Historic sailing barge, built 1929, moored at Maldon's Hythe Quay for a weekend "cottage" hire for up to 14 guests, or choose a weekend sailing on the East Coast for 8-12 guests. 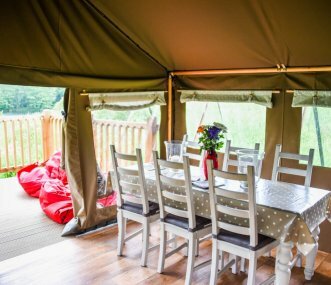 The Stock Gaylard Estate offers 4 exclusive glamping sites, 2 with yurts, others featuring a quirky, comfortable woodsman's wagon and a uniquely designed double decker bus. Looking for a quirky, fun alternative to a general campsite, then The Burrow is perfect for you. Exclusive use of this glamping site, no sharing of any facilities. Accommodation in new 5m Bell Tents. 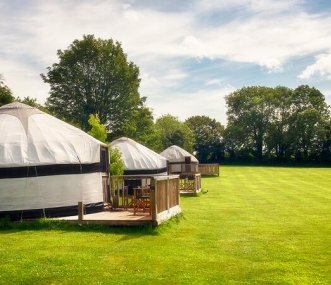 3 luxury yurts in a beautiful rural area of Cornwall. Communal kitchen area in the barn is the ideal space for groups to socialise. Great outdoor BBQ/ firepit and large wood fired hot tub. Sleeps 17. 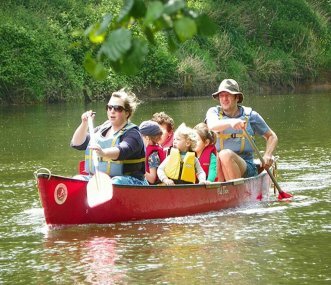 A 19 bed purpose built building within the 18 acre Biblins Youth Campsite on the banks of the River Wye. The oak frame roof rolls back to allow you to sleep under the stars. For youth group trips. The Original Hut Company offers a unique opportunity for a group to escape to the country. Our Huts provide Beautiful, comfortable & Sustainable Glamping and camping accommodation 90 min from London.